My love with Medimix Ayurvedic (Herbal) soap started 10 years back when I started using it. Earlier, I was using a Neem based Ayurvedic soap which disappeared from the market. I saw advertisement of Medimix soap on TV and thought about giving it a try. In this way, I bought my first Medimix soap and started using it. After first use, I decided to try it again. Today, this trend is still continuing and I am only using this soap; though, I tried many other soaps meantime; however, no other soap was able to match the effectiveness of Medimix Soap. Today, I am not the only lover of Medimix soap; this soap is already very popular as Ayurvedic soap and millions of people use it on a daily basis. I like the traditional and original green colour Medimix soap and I have found it most effective; though, they have few other variants of Medimix Soap. 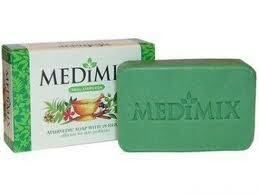 Few years, they also launched Gel based Medimix soap; sadly I did not find them much effective; therefore went back to original green color soap with 18 essential herbs. My skin is very sensitive and often I face numbers of skin problems like pimples, acne and rashes etc. However, when I use medimix green soap regular then numbers of such skin infections decreases considerably. The other good point about Medimix soap’s parent company Cholayil is that they have maintained good quality in their soap so far. Medimix soap, I use today is still as effective as it was used to be effective 10 years back; though, I also feel that there is some space for improvement in the present version of Medimix soap. Overall, I am very satisfied with this soap and I will rate it 9 out of 10.